This textbook is suitable for the following courses: Principles of Macroeconomics. 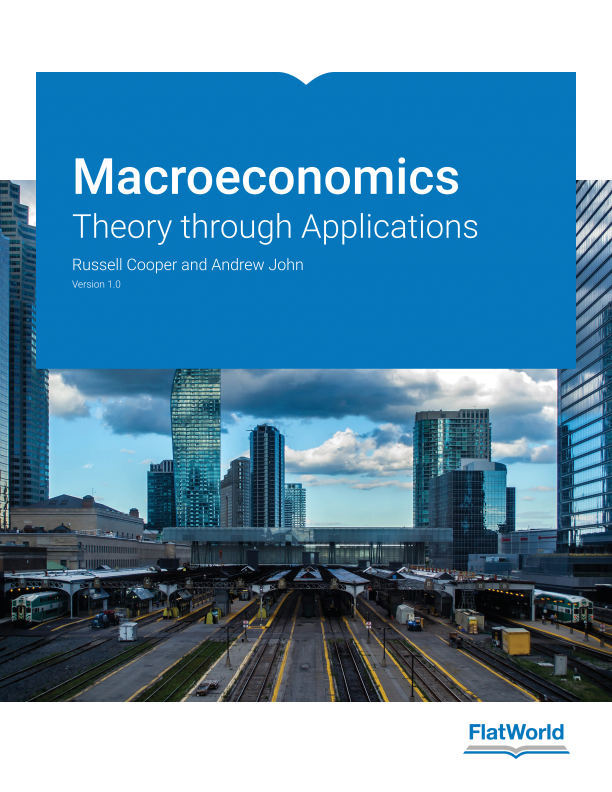 Macroeconomics: Theory through Applications centers around student needs and expectations through two premises: students are motivated to study economics if they see that it relates to their own lives; and students learn best from an inductive approach, in which they are first confronted with a problem, and then led through the process of solving that problem. This textbook will assist you in increasing students’ economic literacy both by developing their aptitude for economic thinking and by presenting key insights about economics that every educated individual should know. Present all standard applications prior to discussing the theory. Student Table of Contents vs. Instructor Table of Contents. 1.4 What Is Economics, Really? 7.2 What Happened During The Great Depression? 7.3 The Great Depression: A Decrease In Potential Output? 7.5 The Great Depression: A Decrease In Aggregate Spending? 13.4 Social Security In Crisis? Russell Cooper is currently Professor of Economics at the European University Institute in Florence, Italy and the Fred Hofheinz Regents Professor of Economics at the University of Texas, a position he has held since 2003. He received his Ph.D from the University of Pennsylvania in 1982 and has held positions at Yale University, the University of Iowa and Boston University. Cooper is a NBER Faculty Research Fellow and the Fellow of the Econometric Society. Andrew John is Associate Professor of Economics at Melbourne Business School. He received his undergraduate degree in economics from The University of Dublin, Trinity College, in 1981, and his Ph.D in economics from Yale University in 1988. He has held academic appointments at Michigan State University, the University of Virginia, and INSEAD. He has also held visiting appointments at the University of Michigan, the Helsinki School of Economics and Business Administration, and the University of Texas at Austin. He joined Melbourne Business School in January 2009. Andrew has consulting experience in the areas of marketing, economics, and strategy. He has worked with clients in Australia, Europe, and throughout the Asia-Pacific region. He has extensive experience in the pharmaceutical industry and has also worked with firms in the consumer goods and consulting sectors. Andrew has taught economics to undergraduates, Ph.D students, MBA students, and executives. His research interests include state-dependent pricing models, environmental economics, coordination games, and consumer boycotts. His published research has appeared in top economics and business journals, including American Economic Review, Quarterly Journal of Economics, Journal of Monetary Economics, Economic Journal, Journal of Public Economics, Management Science, Sloan Management Review, and Journal of Marketing.